Aunt Sarah's Falls are easily seen from the road, but there is a small parking area across the street. These falls are cute and require no hiking. The total drop of the falls measures 90 feet and is approximately 15 feet wide at the top. It falls some 30 feet before fanning out near the bottom. This fanning out is what lends to its beauty. Especially in the winter time as the ice formations get to be quite stunning. From Watkins Glen head South on Route 14. The falls will be on your right a mile or so after leaving town. There is a big curve in the road just before getting into the town of Montour Falls. If you get to the big curve, you have just driven past the falls. There is a parking area across the street from the falls. 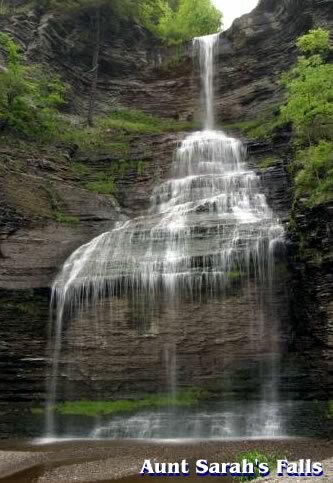 While visiting Aunt Sarah's Falls you should consider seeing SheQuaGa Falls right in the town of Montour Falls. They are also easy to see without any hiking.